I've been on the look out for a wool pencil skirt in burnt orange but haven’t run into anything that caught my attention. Then I decided to look on eBay. I was so excited to find 2 vintage wool skirts for a total of $14.00 (shipping included). The waist measures 24 inches which is perfect for me. Unfortunately, they were a smidgen long and wide for my frame. I decided to bite the bullet and attempt a DIY alteration. I did a video with the intention of showing you how to do this step by step. However, it didn’t turn out very well. It was extremely hard to cut/sew/film at the same time. So no video this time, but I definitely will put more time into it for my next DIY project. I'm impressed by your sewing skills. I can barely sew buttons back onto a shirt. :) Plus, that orange color is really fun. you did such a great job w/ the skirt! and i love how you styled it w/ the blue checkered top! Wow, you slimmed the side with the zipper? Wherever a zipper is concerned, I get stumped. Please share your technique. BTW this pairing looks good on you. Good job Sydney!! Although it does look a smidge tight across the front (a little bit of pulling)? I didn't hem my DIY skirt, but I wonder if you'd get that flared out look like Vicky mentions if you use a blind hem foot? Hmmm. I love that orange skirt and bargain price! and great DIY! :) I always worry that I will make a mess of slimming a skirt! OHHHH!!! that skirt shortened looks AMAZING ON YOU!!! it was def a bit matronly atfirst.. but i'm totally amazed at your DIY prowess!! it looks so amazing and i ADORE that you paired it with the blue gingham print! ps. totally off topic but your hair looks GORGEOUS in these photos!! Only $14? Gotta love ebay. The skirt is so lovely. Love this top paired with that orange skirt (and what a steal!) I had no idea there was even clear thread, lol! Wow, great find and great job on the skirt! Did you do this by hand or with a sewing machine? Also, I really love your gingham shirt! I can't imagine filming while sewing at the same time...that's tough! You are seriously a trooper you posted frequently last week...man do I feel like a slacker! I like the 2 together Sydney! Glad you crossed off the gingham shirt. I still have you to thank for mine. I still like it very much, even though at first, I wasn't sure if I liked it thin, but now it's great for layering. I hope the tips above will help you with your DIY project. Great that you're altering your own skirts. 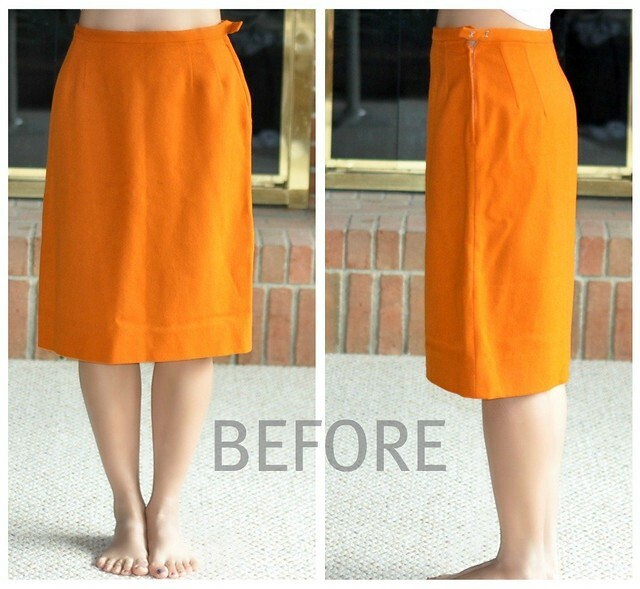 The fact that you even attempted a DIY on slimming and shortening a skirt is amazing in itself! I like the curls in your hair- super pretty. For a hem like that (you don't want to see the line across), you should try a blind hem. You press it to where the hem should be, then when you stitch, it barely snags the front of the skirt every inch or so. You will hardly be able to see your sewing from the front side if you do it correctly. the skirt looks great post-slimming!! i love the beautiful orange color and the fit is perfect! Disclaimer - not a sewing expert..but for that style hem, I think you have to sew by hand...if you want a similar hem to the original. But the length/width is perfect on you. What an impressive DIY job! My mother attempted to teach me how to hem my own skirts once, but I'm afraid I still haven't gotten the hang of it...I hope you do a video soon, maybe that'll help me learn! And on another note, love that skirt. It's such a vibrant color! You did a great job! I have yet to try doing any DIY alterations myself but I am tempted :) I love the color of the skirt, what a great find! sydney -- i love the gingham combo! i been looking for one too. i can't believe u attempted to slim a skirt yourself. lol, i wouldn't know where to start. looks great! love the combo! You are right.. the white thread is very visible! Cant wait to see it when you re-do it with clear thread. Wow! I am so impressed with your sewing skills. I really need to start doing my own alterations. I love the outfit, too! I recently wore an orange skirt with a navy top as well =). Your blog is lovely and a great resource for fellow style-conscious petites! Sydney, you've got the best yellow/gold/mustard skirt collection. Love the after photo with the gingham top and didn't even notice the hem until reading some of the other comments. I still say a great job with your first sewing experience! How clever your are love the colors and the whole outfit! And you´ve a PERFECT blog ! Nice deals on the skirts - the one you're wearing is the perfect length on you! I love it. You are so crafty! Sydney, I meant to comment on this post a while back. I must've read it three times but always on my phone, lol. Great job for your first DIY. i love the color of this skirt on you, and you know I'm a fan of "refashioning" pre-owned skirts purchased at a bargain. In regards to what Vicky said here and on Twitter, I think it may be helpful to take local sewing machine classes. I don't know what places offer them other than Jo-anns or something. When I first got my sewing machine, I could only do the straight or zig zag stitch, and nothing came out looking great. I took weeks of classes in China and now I can do some really simple things, but still much better than before! Although, if I remember correctly you have a talented parent who could probably teach you even better than a class. @PetiteAsianGirl Hi Jean, I took a sewing class last year at Jo-Ann. However, it didn't help much. I wish my Mom would have time to show me some techniques but she is a busy women =) I hope to pick up a few tips here and there. That is awesome that you did it yourself! The skirt is a very pretty color. wow...love this! i'm on the hunt for some j crew button downs too but im not sure what size id be!